When one is in the tower of London one learns very quickly what is the legend of the two princes. In fact, it is not really a legend, but history mixes betrayals, murders, secrets and unveiling, so from this historical fact, one quickly makes a true legend. The fact remains that all this begins in 1483. That year King Edward IV. Died, leaving behind two sons too young to govern. The eldest, who is 13 years old, is Edward V, he is accompanied by a younger brother of 9 years barely who has the title of duke of York. Now Edward had a brother, Richard, Duke of Gloucester. Taking advantage of the situation, the latter was officially named "protector of the kingdom" on 8 or 10 May, which is tantamount to ensuring the regency. He also took charge of the education of his nephews, which consisted of locking them immediately in the bloody tower, which did not yet have that name at the time. Soon after, the princes had disappeared. 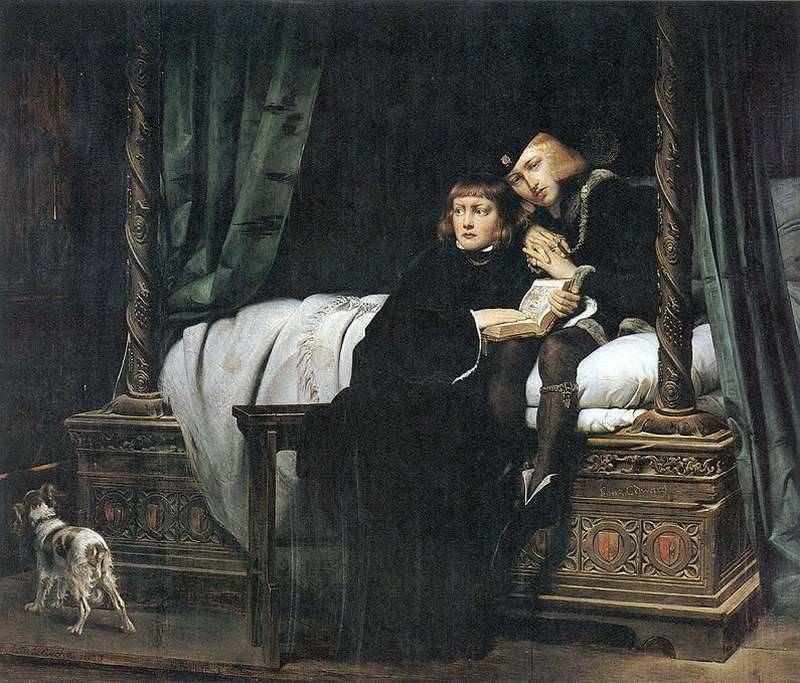 They were last seen at the end of June 1483 and it is traditionally believed that the most probable reason for their disappearance is that they were assassinated in late summer 1483. 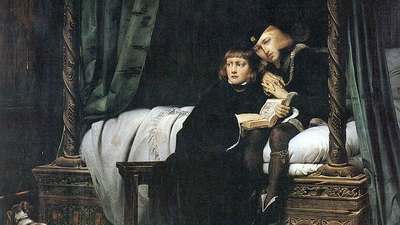 But specialists do not necessarily agree on this subject, there is a conflict over the place and fate of Edward V and his brother. Traditionalists believe they were killed by their uncle Richard, while the revisionists argue that Richard received the wrong role through Tudor propaganda but that his successor, Henry VII, had the same reason for removing the two boys as they stood on his way to the throne as much as Richard. On Friday the ... day of July, Year 1674 ... to reconstruct the different offices of the Tower and to erase the White Tower of all the adjoining buildings, digging the stairs that led to the King's house, chapel of the said Tower, about ten feet in the ground, were found the bones of two children in (as it seemed) a wooden chest which, according to the survey, was proportional to the ages of these two brothers, about thirteen And eleven years. The skull of one was whole, the other broken, as were many other bones, so the chest, by the violence of the workers, who ... throw the garbage away, caused these breaks to recover the garbage and, thus, have preserved all the bones. The circumstances of the story being considered and having often discussed with Sir Thomas Chichley, Master of the Ordinance, the industry from which the new buildings were then being made, and by whom the matter was reported to the King. Charles II, then the reigning monarch, believing that they were the bones of the two princes, asked the architect Sir Christopher Wren to design a white marble coffin and the bones were reverently placed in the Henry VII chapel at Westminster Abbey, near the tomb of The Prince's Sister, Elizabeth of York. A monument designed by Sir Christopher Wren now marks the supposed place of rest of these princes. The burial of the two boys did not definitively put an end to the question as to who these boys really were. After all, it is not because two children have disappeared and two centuries later children's bones are found again. A thorough study was therefore undertaken to know the history, if possible. It was Georges V who requested that the bones be exhumed for expert appraisal in 1933. Their studies were carried out by Lawrence Tanner MD, L'OBE, Archbishop of the Abbey, Professor William Wright, the Anatomical Society of Great Britain, and Dr. George Northcroft, then President of the Dental Association. Professor Wright concluded that on the evidence of the development of ossification of the bones of the vertebra, he thought that they were bones of two children, the eldest being twelve to thirteen years old and the youngest nine at eleven. The Tanner and Wright report and accompanying photographs of the bones have been thoroughly reviewed on several occasions since then. The modern conclusions vary, but there are no formal answers to the fact that we are in the presence of the two princes. The mystery continues. 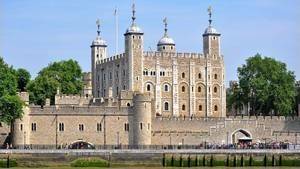 If we are to believe the legend, the bloody tower is haunted by the ghosts of the two princes. The guards at the end of the fifteenth century reported that, passing the bloody tower, they saw the shadows of two little figures sliding down the stairs still wearing the white clothes they had the night they disappeared. They are said to have stood silently, hand in hand, before disappearing into the tower's stones.